Geology and Stuff: My first dinosaur fossil! After me and my family went to totara park we went to papatoe gemstone show in the town hall. That's absolutely amazing that's its that old - I have an old coin we used to encourage writing in class but that was only 400 years old. Wow. Does it feel funny being so old? 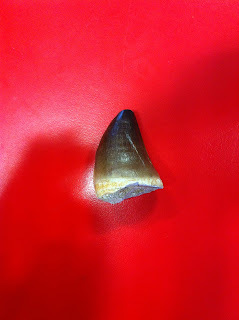 It must have been quite difficult to see this tooth in the soil, I wonder if it was a whole jaw, or a single tooth? Imagine what the world must have looked like 400,000,000 years ago. Our Lady Star of the Sea School, Howick, Auckland. Tayin, How on earth do you know that it is 400,000,000 years old? Mrs Chambers, Room 19, Pinehill School in Browns Bay. That's amazing! I bet it was hard working as a dinodentist all those years ago.